Few models in the Toyota stable cater to family like the Toyota Sienna minivan. Nicknamed the “Swagger Wagon”, the Toyota Sienna promises an athletic performance and style that minivan competitors cannot match. Loaded with family-friendly technology and features that include Toyota Entune 3.0, the 2018 Toyota Sienna is perfect for the neighborhood carpool and your family adventures. Driver Easy Speak is a favorite feature for countless families and many drivers want to know how to use the Toyota Sienna Driver Easy Speak feature. Learn more with this how-to guide from Courvelle Toyota. Have you ever struggled to communicate with combative children sitting in the third-row of your minivan or crossover? Toyota Driver Easy Speak may be the answer to your parenting woes. With this innovative feature equipped, you can magnify your parental commands via the Toyota Entune sound system, projecting parental authority through the rear speakers. At the press of a button, Driver Easy Speak employs a built-in microphone that will amplify your parental commands with voice-command technology. 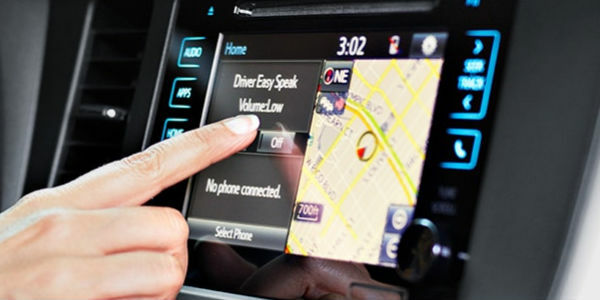 An easy-to-use feature, Driver Easy Speak performs as a function of the Toyota Entune infotainment system. To use this family-friendly feature, you must activate Driver Easy Speak when you enter the Toyota Sienna via the Toyota Entune Apps screen on the touchscreen display. This innovative system will turn off automatically when a door is opened. Driver Easy Speak has seven volume settings to help you establish parental authority over unruly rear passengers. Have you gone hoarse trying to convey parental commands to warring children in the third row of your Toyota minivan or SUV? Learn how to use the Toyota Sienna Driver Easy Speak feature and amplify your parental authority through the Toyota Entune sound system. Visit the Courvelle Toyota inventory today and experience the convenience of Driver Easy Speak firsthand!